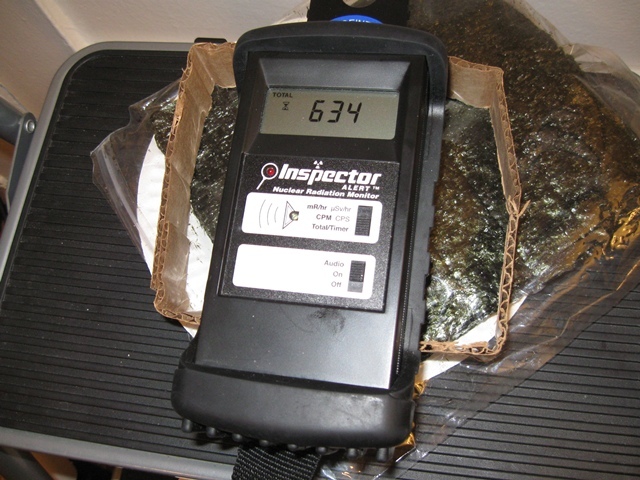 On April 13, 2012 EnviroReporter.com tested Nori seaweed from Japan bought in a West Los Angeles store, the same one where this reporter bought the identical item eight months ago soon after the Fukushima Daiichi meltdowns began in Japan. The trendy and ‘organic’ delicacy, popular with LA hipsters, was 94.7% above normal, 17.6% of that additional ionization indicative of alpha radiation which can be 60 to 1,000 times more dangerous than beta and gamma radiation. 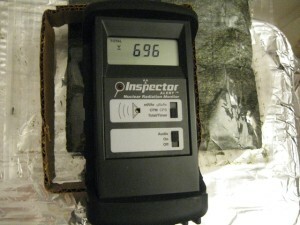 These tests were performed with an Inspector Alert nuclear radiation monitor, the same detector EnviroReporter.com has used in over 1,500 tests for Fukushima radiation beginning four days after the March 11, 2011 triple meltdowns at the destroyed Fukushima Daiichi six-reactor complex in Japan. 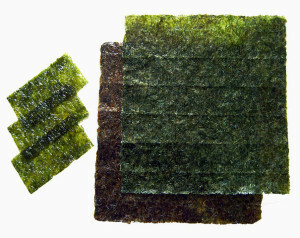 Nori seaweed is considered a delicacy and consumed upon eating sushi wrapped in it or straight out of the bag in thin green squares like the product purchased by EnviroReporter.com. This kind of seaweed can be purchased at nearly 50 Japanese and Japanese-American stores in Southern California as well as in about 900 Japanese restaurants and sushi bars throughout the Southland. A retest of the same brand of seaweed bought from the same Japanese market last August was equally disconcerting. The initial August 23, 2011 Nori seaweed test showed only slightly reduced ionization indicating the presence of medium to long-lived radionuclides possibly including cancer-causing cesium-137. Also still showing the presence of alpha, the earlier sample still was 44.2% over a previous background while still in the bag, which shields alpha radiation from detection by an Inspector Alert. Last year, the seaweed was 54.2% higher than background therefore experienced a 10.0% decrease in ionization over nearly 8 months. That translates to a 15.4% decrease of the radionuclide(s) per year while in the bag. Removed from the bag, the older seaweed was 55.0% higher than the previous background with 10.8% of background exceedance being alpha radiation. Last year, this same seaweed tested out of the bag 67.2% above background meaning that it had decreased 12.2% in ionization for the period, or an 18.8% decrease including the alpha. So not only is the new Japanese Nori seaweed sample hotter than last year, the older seaweed is still heavily ionizing as well. Both exhibit strong alpha presence and both have been and are being sold to an unsuspecting public in ethnic and trendy Los Angeles neighborhoods alike. Last year, EnviroReporter.com tested other Japanese food products that also showed significant radiation above normal including beer, sake, vegetable juice, sweet rolls and three different types of tea, including green tea that came in 65.1% over normal. The Japanese and American governments are either not testing this food product for Fukushima radiation, or one or both of these bureaucracies have deemed this amount of radiation to be acceptable. Indeed, the Japanese have a system that could allow for the exportation of fish and food products that they determine too radioactive to eat to the United States which has standards up to dozens of times more lax when addressing the specific kinds of radionuclides spewing out of the uncontained triple meltdowns. These weaker American radiation standards are not some arcane bureaucratic detail – more radiation means more cancers and death. The most august scientific body in the nation has confirmed this beyond scientific doubt. In late July 2005, the prestigious National Academy of Sciences came out with a milestone report that confirmed this. “The scientific research base shows that there is no threshold of exposure below which low levels of ionized radiation can be demonstrated to be harmless or beneficial,” said Richard R. Monson, the panel chairman and a professor of epidemiology at Harvard’s School of Public Health. Yet the government agency that is supposed to regulate what’s in our food has been using standards and procedures created back in the early 1960s not having formalized updated techniques in the 1990s according to the Food and Drug Administration’s website. FDA radiation standards aren’t even mandatory. They exist in the ether of being “recommendations” that are not enforceable. Japanese standards for strontium-90 and iodine-131, two of the most dangerous radionuclides associated with the Fukushima meltdowns, are three times more strict than their American equivalents. FDA limits for one of the most prevalent and fearsome radionuclides, cesium-134 and cesium-137 have a combined limit that is 24 times the Japanese limit for this deadly bone and blood-seeking radionuclide in baby food and milk. The American red line for Cs-134 and Cs-137 combined for general food is 12 times more lax than the Japanese ones. High radiation in Japanese seaweed was of concern since Greenpeace announced in May 2011 that it had been collecting seaweed off of Fukushima and found it loaded with radionuclides. Ten out of twelve seaweed samples exceeded 10,000 Becquerels per kilogram (bq/kg) though it wasn’t clear if the radionuclides were cesium-137 and/or iodine-131 which have Japanese contamination limits of 2,000 bq/kg and 500 bq/kg respectively. The environmental group was drawing attention to how hot the seaweed was, a message clearly not heard by the Japanese government. Nearly a year later in early March 2012, a fishing village named Utatsu in the Miyagi Prefecture resumed seaweed farming around 60 miles north of Fukushima Daiichi. That directly down current from the northern flowing current from where millions of tons of sea water have been hosed on to the melted reactors’ molten masses of corium. This has spread massive amounts of the most most deadly radiation known into the Pacific. The reaction to this environmental catastrophe, which already shows signs of sickening ringed-fur seals and polar bears, has been practically non-existent. No government or environmental organization is known to be even testing the Pacific Ocean water, even when the impacted area – the size of California with boats, toys, diapers, lumber and radioactive sea water – makes it way eastward. The Sea of Goo is now between Midway and north of Hawaii, a floating Hell in the Pacific. The miseries inflicted on the wild marine life there haven’t even been studied, such is the hubris of government and the public alike to the radioactive genocide beneath the waves. Fresh and salt water poured, sprayed and dumped on the melted reactors have created a real-life Hell in the Pacific. That core-cooling water, according to a University of California, Davis report released in January and broken as a story in Beta Watch, turns into peroxide as tons of the reactors’ uranium fuel breaks down into hearty nanoscale “buckyball” cages of uranium-60. The toxic soup feeds on itself which in turns corrodes the fuel at increasing rates, all of which flows unabated into the ocean despite repeated claims by Tokyo Electric Power Company, which owns Fukushima Daiichi, that it is somehow sequestering this highly radioactive water onsite. Whether that matters to TEPCO is questionable. The company announced last year that any radiation escaping its Fukushima Daiichi complex was no longer its property therefore no longer its problem and that it isn’t liable for it. The American government didn’t even react. It didn’t matter to the radiation either. These highly mobile and light nanospheres of uranium isotopes of different radiation types combining in different combinations within a U-60 buckyball, pack a punch for a long time. After 294 days in the laboratory, the buckyballs were still sizzling hot according to the U.C. Davis report. Now they are moving north on the Kuroshio Current past Utatsu on their way across the Pacific towards the United States and Canada. Happy Utatsu villagers can be seen in a recent news video on the MercyCorps website harvesting seaweed with the help of the American charity organization. The problem is that where they are seaweed farming is just one tenth the distance from Fukushima Daiichi than the 1,100 kilometers away the hot Nori we purchased in West L.A. was grown. Neither the farmers, MercyCorps spokesman or television reporter showed even an awareness of the dangers of gardening in the Sea of Goo. Americans, bereft of adequate food inspection and radiation laws and the largest consumers of seaweed in the world, are also adrift in a sea of uncertainty when trying to discern which seaweed is safe. Nori is one of three main types of Japanese seaweed or kaiso predominant in the the nation’s food culture with seaweed consumption going back at least 1,500 years according to the 1980 book Seafarm: the story of aquaculture by Elisabeth Mann Borgese. The first known seaweed farming began in Tokyo Bay just before 1670 when farmers would toss bamboo branches into muddy, shallow water where seaweed spores would attach to them. The spored-branches were then placed in a river estuary to grow. During and after World War II, the Japanese updated these techniques by attaching synthetic net-like material to the bamboo poles, an innovation that doubled production. The hibi method of stretching rope between bamboo poles became a cheaper version of this new kind of seaweed aquaculture. By the early 1970s, with the organic foods culture on the ascendance, demand for the plant and its products far exceeded supply and mechanized cultivation began in earnest. Demand has continued to rise ever since. 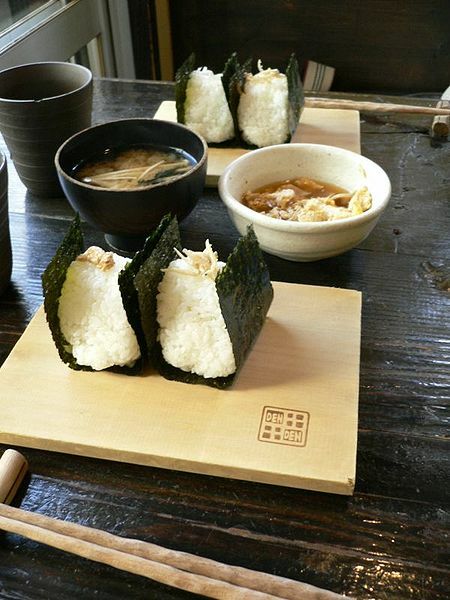 The most common seaweed types used for daily Japanese cooking are Kombu, Wakame and Nori. Kombu, a large kind of seaweed, is used in nabe (hot pot) dishes and soup stock. 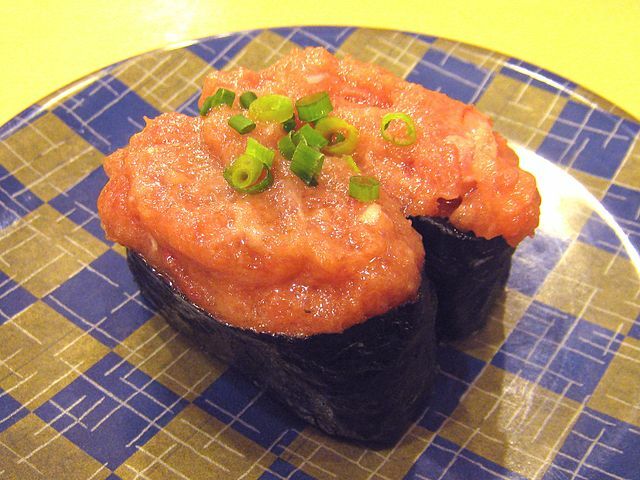 It is farmed extensively in the seas of Japan and Korea. Most Japanese Kombu is cultivated in the waters of the northern Japan island of Hokkaido but is also grown as far south as the Seto Inland Sea that separates the islands of Kyūshū, Shikoku and Honshū. Wakame, also used in soups and salads, is known for a compound called fucoxanthin which supposedly burns fatty tissue according to a 2005 report by the Laboratory of Biofunctional Material Chemistry, Division of Marine Bioscience, Graduate School of Fisheries Sciences, Hokkaido University. The seaweed is also infamously nominated as one of the hundred worst invasive species according to a list compiled by the Global Invasive Species Database managed by the Invasive Species Specialist Group supported by the University of Auckland, New Zealand. Most people know the seaweed better in a bowl even as the plant has plagued the United States, Great Britain, France, Italy, Argentina, Spain and Australia. Miso soups and sunonmono salads are made up of Wakame seaweed. Nori seaweed, as noted, is used to wrap sushi and rice balls and spread on dishes as a condiment or topping. Today, Japan exports $2 billion worth of Nori seaweed alone to the United States. Over 230 square miles (600 sq mi) are devoted to this multi- billion dollar industry that farms over 386,000 tons of the prized seaweed annually. While Nori seaweed isn’t necessarily indicative of the relative amount of radiation contamination other Japanese seaweed may have, it is particularly notable that any of this kind of seaweed would show such significant levels of alpha, beta and gamma radiation at all. High end Nori is cultivated over 1,100 kilometers (~680 miles) away from the stricken Fukushima Daiichi complex in Ariake Bay at the southern tip of Japan. This increasing radiation is not just grim news for people who consume seaweed by itself or as the most common edible wrapping for sushi, it also impacts dozens of common products that use the seaweed extracts carrageenan, agar and alginate. The water-retaining properties of these gelling substances are used in toothpaste, beer, poultry, fish and meat products, desserts, molded foods, dairy food, salad dressings and sauces, preservatives, dietetic foods and baked goods. Like vast sponges in the Pacific, seaweed of any kind that is used for these and many other purposes is susceptible to radiation contamination in the Sea of Goo. EnviroReporter.com posits that this radiation isn’t somehow filtered out in the manufacturing of carrageenan, agar and alginate which could become a major public health hazard. Concerns over radioactive contamination of seaweed is heightened by the fact that Far East Asian countries, like Japan, Korea, China, Indonesia and the Philippines, make up 90% of the world’s supply. These countries’ waters are also expected to be impacted by the gargantuan amounts of goo going into the Pacific if, for no other reason, they are closer to Fukushima Daiichi than other seaweed-growing regions around the globe. EnviroReporter.com will begin testing food and consumer products containing these seaweed products for heightened radiation. 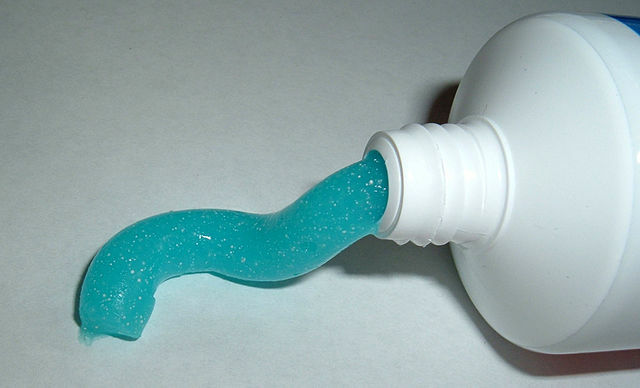 That testing will begin with a tube of one of the leading brands of toothpaste currently used at Radiation Station Santa Monica. Refraining from buying products with these ingredients is as simple as reading the label. Regardless of the potential threat to one of the most popular foods in Southern California, Nori-wrapped sushi, it is unlikely that raw fish enthusiasts will be giving up the trendy cuisine anytime soon. The paper ranked Urasawa of Beverly Hills as its number one choice. Urasawa customers who fork (or chopsticks) over $375 for an extravagent 30-course, one to two-bite per course sushi meal, also have their choice of four to five Japanese seaweeds to pick from. Even at those prices, that may be one of the hottest deals in town. 9:10pm 10-minute INTERIOR average of April 13, 2012 JAPANESE SEAWEED OUT OF BAG: 76.5 CPM^ which is 94.7% HIGHER THAN SUBSEQUENT BACKGROUND. 17.6% of background exceedance is ALPA. April 13, 2012 background exceedance is 40.9% increase over August 23, 2011 exceedance. Nothing on the SeaSnax site indicates that they test for radiation at all. While one online article written by a person using only her first name claims that she talked to the SeaSnax “owner and creator” writes that the company tests “3-4 times a year for Iodine 131 and the 2 cesiums” is hardly confirmation of Fukushima radiation-free seaweed. If that testing claim were true, then we believe that this is not nearly enough testing (whatever “testing” means in this case as there are different ways to test for suspect meltdowns radiation in seaweed). We continue to strongly advise against consumption of any food products from the Pacific, especially seaweed. If seaweed consumers can’t part with their product of choice, we recommend obtaining seaweed grown off of New Brunswick Canada. People do not have little pieces of paper in their bodies floating around blocking alpha radiation, “Rachelle.” Alpha radiation, like the Plutonium 239/240 we talk about in last week’s “Boeing’s Meltdown Mess,” is far and away the most dangerous form of radiation compared to beta and gamma. Are you kidding me?! Alpha particle radiation more radioactive than Beta and even Gamma radiation?! Alpha particles, while not healthy in the body, are the safest form of radiation. They literally can be stopped by a piece of paper. This article has such infactual statements that I’m never coming to this site again. I want actual facts, not bended truth that leaves me even more uninformed than I was to begin with. Everyone else needs to leave this website, or at least have the author suspended. How about Trader Joe’s wasabi nori – a product from Korea that’s packaged in Cali? Just noting some debates on here. Sharing this link for clarity and logical deduction of safety. Just google radiation in cows milk, rice, etc.. on the westcoast of the US. You can see the reports on various issues caused by Fukoshima. I would suggest avoiding any fish or seaweeds unless it is sourced across the world from Japan. The question is asked if the fish off the West Coast of the USA are “hot.” Recent articles state they are emitting higher radiation that they think is b/c they are eating the radiation seaweed floating over from Japan. I have been looking for reports about Alaska salmon which also eat seaweed that floats in from Japan but have not seen any studies as of yet. Do due diligence before eating from the Pacific. @aussie: Your comment’s first sentence suggests you are joking but the rest of your screed actually confirms you don’t have a solid grasp of the science related here. We have clearly described the difference between alpha and beta particles and how we were able to measure their presence in the seaweed. Your last sentence betrays your ignorance of the radionuclides gushing out of Fukushima’s triple meltdowns: the beta-emitting radionuclides of most concern are cesium-137, cesium-134, strontium-90 and uranium isotope-filled “buckyballs” all of which are medium-lived and, in the case of the cesium-137, lasts up to 300 years before fully decaying. Try checking out the actual facts about Fukushima radionuclides by reading the umpteen posts, articles and comments on EnviroReporter.com. To observe radioactivity has doubled for Nori seaweed means you need only eat half as much seaweed as before to ingest he same quantity of radiation. Alarmist remarks about alpha and beta particles need a lot more explanation and qualification than you provide. Radioactivity in the sea, indeed, in the atmosphere, is natural. It is invariably concentrated in sea organisms. What distinguishes natural radioactivity from artificial sources is that the latter are generally short-lived, particularly Iodine isotopes that cause the spikes in local levels for a few weeks. To clarify: I emailed them via their website on 11 Feb, never got a reply, so wrote a letter on 22 Feb. Received reply (to this letter and original email), by email, on 27 Feb.
Update to my previous comment: Pret say their nori in the super veg wrap is from Korea. (Note that they replied by email to my written letter.) Like Rebecca, I’m still none the wiser as to its safety. I’ve suggested that they display more information (which they won’t, of course). Do you have any current information on potential radioactivity in Nori imported from South Korea (2013)? My family loves the packaged roasted seaweed squares from the brand Sea’s Gift, which is available at Whole Foods stores in individual size packs (5g). Thank you very much for any help. If seaweed is hot then I wonder how hot fish is? Izumi claims their Nori is 100% chemical and radiation free cause it’s tested. Any thoughts? Has anyone actually tested seaweed from Iceland? Shirakiku seaweeds are, according to the package info, a “product of China”, though Shirakiku is a Japanese company. Any info about the radiation status of their seaweed? I wish this article was more specific in describing the source of the Nori. As many people here might know, much of the Nori comes from the southern shores of Japan and in the southwestern Sea of Japan. Emerald Cove sushi Nori, for example, is harvested in Chinese waters in the southwest sea of Japan and is certified organic. Navitas also claims its Nori, also organic, comes from southwestern Japanese waters. I am not affiliated with these companies, but discovered this information through thorough research. Naturally, Nori harvested from around the disaster site will have high radiation readings, but the wind and currents is pushing that contamination eastward towards the US. Thus, it would be very useful to test seaweed from different regions. If anyone has more information on this matter, I think we would all benefit from a response. FYI: With regards to seaweed other than Nori (e.g., Kombu) you are better off just going with an Icelandic brand which is very similar. Editor: thank you for your vigilance. I spoke with a respected pharmacist in the Boston area who told me that DMSO (dimethyl sulphoxide), used in chelation therapy, would be the thing to use to remove radioactive heavy metals. I’m passing this along because, though I know DMSO is controversial and can have serious side-effects, if it should come to that I might consider using it (under care of an environmental medicine doctor only) for my child — again ONLY as a desperate measure. DMSO is used to treat autism in children. Ok, so I won’t eat seaweed…..don’t anyway….but I do use toothpaste, ground beef, gravy, jello. Alot of items have elements from seaweed. This is a big problem. This stuff does not break down, it will damage the person eating it, then he/she will pass it trough the body into our waste treatment plants, where it will be released into our waterways. Japan is not just killing the Pacific! Question. I use solar salt in my water softener. This salt is from evaporated seawater….Just wonder when this will become to “hot” to handle. Other items on the list of items to avoid would be sea minerals nutrient suppliment – and Fish Oil capsules- Fish Sauce – oysters-muscles – prawns(shrimp) live on ocean floor eating rotten flesh vegetation- its best to avoid all seafood after a tsunami.. most asians avoid eatting seafood after tsunami becuase of the loss of human lives and the crustaceans fish and prawns eat those rotting corpses that are washed out to sea .. sad but true.. the tourist seem to be impressed by the size of the prawns.. the animals tastes of what it has eaten.. Drink from glass containers. Use cast iron. Use organic spread. Buy a air popcorn popper. Fast (do not eat solids) one day a week. Mono diet (eat raw veggies / raw fruit only) one day a week. Buy a scale to keep body weight in check. Regularly take supplements to beat the radioisotopes to the punch (read Professor Chris Busby’s work on the topic). All I mean is, folks it does not matter what it is, some folks stay away from it. Microwave popcorn, the bags give off a chemical… Non stick skillets, the coating used for the non stick gets into our body… Margarine is only a molecule away from crude oil… Plastic bottles are giving babies and drinkers of bottled water a chemical… etc.. see what I mean. I wonder if Ralph understands that it’s obvious to most that he is pretending to be knowledgeable, but the reality is, the opposite is true. He is showing a tremendous ‘lack of knowledge’. Maybe his lame comment actually helps, in some ways, bring the deceptions and misconceptions about FALLOUT, something we cannot see, taste or smell to the forefront. I can only hope. 2. Research suggests a ‘significant’ risk. Okay. Got it! I will NOT eat the seaweed. Such ignorant statements by RalphBarnes and JohnnyBartee! Seaweed is a major food in the Japanese diet. Is there a safe source of seaweed remaining on the planet? Michael good article though please start a petition using your facts on change org and it might get standards changed or at the very least will help spread awareness. The seaweed is still testing hot overall and it’s showing hot for alpha too. That is ‘sooooo’ important folks! I hope more people are starting to ‘listen’ and understand this. I pray for the children of Japan and the children of the world today. The simple truth here is overwhelming. Alpha radiation is dangerous when alpha-emitting radioisotopes are ingested (breathed or swallowed). This brings the radioisotope close enough to tissue for the alpha radiation to damage cells. Per unit of energy, alpha particles are at least 20 times more effective at cell-damage as gamma rays and X-rays. Examples of highly poisonous alpha-emitters are radium, radon, and polonium.